Pyhan Laurin kirkko has been added to your itinerary. 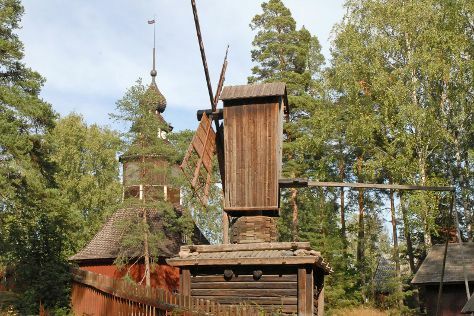 Seurasaari Island and Open-Air Museum and Cathedral of Porvoo will appeal to history buffs. Do some cultural sightseeing at Kansallisgalleria and Natural History Museum (Luonnontieteellinen Museo). Get out of town with these interesting Helsinki side-trips: Porvoo Old Town (in Porvoo) and Forssa Museum (in Forssa). There's much more to do: steep yourself in history at Mannerheim Museum, admire the landmark architecture of Pohjolan toimitalo, head outdoors with Sunlines, and stroll the grounds of Hietaniemi Cemetery. For ratings, reviews, other places to visit, and tourist information, use the Helsinki visit planner. If you are flying in from United States, the closest major airport is Helsinki Vantaa Airport. In October, daily temperatures in Helsinki can reach 48°F, while at night they dip to 35°F. Finish up your sightseeing early on the 25th (Fri) so you can travel back home.